Snapchat is a messaging app lets users easily talk with friends, check out ‘Live Stories’ from all over the world, and read up on recent news. But is it also the latest, greatest way to ghost hunt? From invisible faces detected by filters to strange activity and creepy figures, is the Snapchat app really a low tech social media ghost meter? For the last 5 years, Chapman University in California has conducted a battery of surveys focusing on in-depth examinations of American fears. Their research studies a range of topics, from government, health and environmental matters, to disaster preparedness, personal anxieties, and paranormal beliefs. 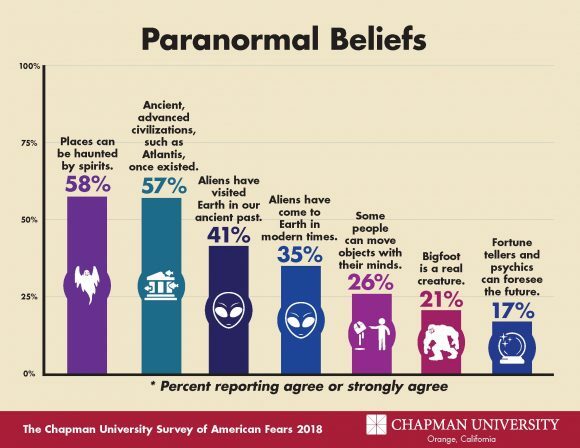 The Chapman University Survey of American Fears Wave 5 (2018) includes a battery of items on paranormal beliefs ranging from belief in aliens and psychic powers to Bigfoot and haunted houses. Currently the most common paranormal belief in the United States is that places can be haunted by spirits (57.7%), followed closely by the belief that ancient, advanced civilizations, such as Atlantis once existed (56.9%). More than two out of five Americans (41.4%) believe that that aliens visited Earth in our ancient past and more than a third believe aliens are visiting now (35.1%). Of the items we asked about, Americans are the most skeptical about fortune tellers, with only approximately 17.2% believing that others can see the future. Paranormal beliefs have become the norm in the United States, if we examine how many such beliefs a person holds. Using the seven paranormal items included on the Chapman University Survey of American Fears Wave 5 (2018), we find that only about a fourth of Americans (24.1%) do not hold any of the seven beliefs. What this means is that more than ¾ of Americans believe in at least one paranormal phenomenon. The Chapman University Survey of American Fears has included the same set of questions about paranormal beliefs on three waves of the survey. What is striking is how rapidly such beliefs are rising. Belief in six of the seven paranormal items increased between 2017 and 2018, the only exception being the belief that fortune tellers and psychics can foresee the future. All seven items have risen in levels of belief since 2016. For example, Americans are fourteen percent more likely to believe that aliens once visited the earth than they were in 2016. Americans have become seven percent more likely to believe in Bigfoot in only two years. Given that our survey includes a margin for error of +/- 3%, we should note that some of these changes maybe be slightly bigger or smaller than presented. However, the major pattern is clear – American is becoming more paranormal. What do you think is responsible for this increase in paranormal fears and beliefs? Share with us in the comments! History is marred by countless accounts of murderers who committed heinous acts and gruesome killings. Arguably some of the darkest crimes were the work of repeating offenders - serial killers who left their stain on the world over and over again with each horrifying act. Some of these criminals were caught and tried for their crimes, while others remained anonymous and at large. Among them all, there also seems to be a number of killers who continue their reign of terror, even after their own deaths. Jack the Ripper is possibly the most infamous serial killer of all time. In 1888, he gruesomely killed five women in England. He was also the first serial killer to taunt the press by sending them letters, creating a worldwide media frenzy and becoming the first “modern” serial killer. Adding to his terrifying legacy is the fact that he was never successfully identified, let alone caught, so his crimes are also shrouded with mystery as well as brutality. Despite his undetermined identity, the ghost of Jack the Ripper is believed to haunt several locations in London, including the sight of his second murder - 29 Hamburg Street- and a pub where patrons have reported seeing a “ghastly old man in Victorian clothing.” It was in this same pub where his victim Annie Chapman was drinking before Jack the Ripper savagely killed her. Jack the Ripper’s five victims also haunt London on their own. On the street where Mary Anne Nichols had her throat and abdomen slit, people report hearing horrible gasping noises and an argument between an unseen man and woman, along with seeing her body lying in the street. The ghost of Elizabeth Stride has been heard crying for help, and the apparition of Catherine Eddowes has been spotted multiple times. Another victim, Mary Kelly, was witnessed speaking to people in the street hours after she had already been murdered. In the 1970s, Ted Bundy killed at least 30 women across seven states, though his murder tally is suspected to be much higher. He was executed for his crimes in 1989, but allegedly his ghost has lingered. A decade after he died, a prison guard divulged to a reporter that several guards claimed to have come across the ghost of Ted Bundy casually sitting on the electric chair - and creepily smiling his signature smirk. If anyone tried to approach him, he would disappear. At one point the sightings were occurring so often, the prison warden couldn’t find anyone willing to enter the execution chamber alone. Bundy also began popping up in prison cells, housing units, and his holding cell on death row. Once his ghost even spoke to guards, boasting “Well, I beat all of you, didn’t I?” According to an inmate, Bundy’s ghostly visage appears as a blue-white mist, but is so detailed it’s impossible to deny that the likeness is Bundy. And he’s always, always smiling. In recent years there have also been reports of ghostly activity in Ted Bundy’s childhood home, including dressers falling over, drawers opening on their own, and words being mysteriously scrawled in the dust, but no one has yet identified the ghost as Bundy himself. 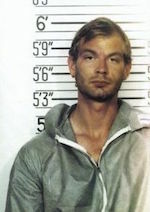 Between 1978 and 1991, Jeffery Dahmer, the Milwaukee Cannibal, killed and consumed 17 men. For his horrific crimes, he was sentenced to 16 terms of life imprisonment, but was beaten to death by another prisoner in 1994. Since his death, Dahmer’s childhood home in Bath, Ohio - and the place he committed his first killing - has been the site of haunted activity. The ghost of Dahmer and several other spirits (perhaps victims?) have allegedly been seen inside the house, but the most significant activity has come in the form of EVPs. Known as one of the best places in world to capture EVPs, it’s been reported that ghost hunters have rented out the house for as much as $10,000 a night in search of Dahmer’s ghostly voice. In the video below, one such ghost hunter shares numerous EVPs that he captured on the property, including words and phrases that sound eerily like “can’t breathe,” “run,” “stop the bleeding,” and more. The disturbed John Wayne Gacy abused and murdered at least 33 men and boys between 1972 and 1978. Because of his penchant for dressing as “Pogo the Clown,” Gacy has become known as the Clown Killer. All of his known murders were committed at his ranch house, 8213 W. Summerdale Avenue in Chicago, where he buried over two dozen bodies in a crawl space and several more in the backyard. Although the original Gacy home was razed during the police search for so many bodies, different owners of the house that was later built on the property allegedly reported screams in the night and bloody apparitions. 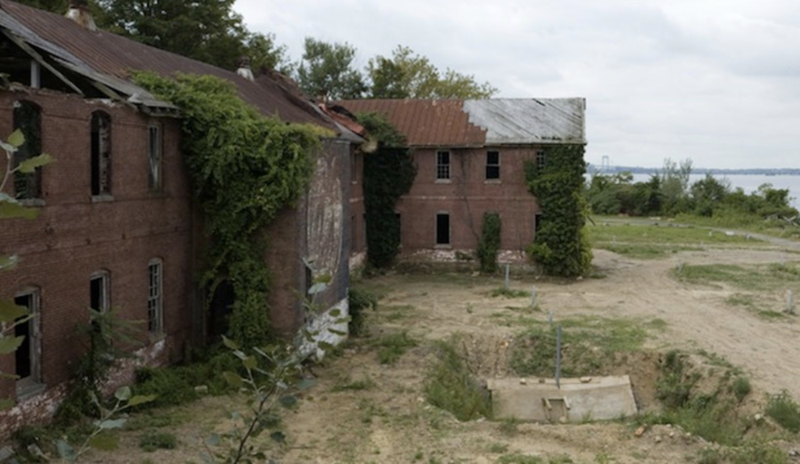 For several years after Gacy’s house came down, no plant life would grow on the lot, although supposedly there was no logical explanation for the yard to remain barren. The lack of vegetation on only that spot confused the neighbors, and people began to believe it was some kind of mark on the property, left behind by Gacy’s evil works. While none of these strange events is attributed directly to the ghost of Gacy, his terrible legacy was still a hulking specter, even forcing new homeowners to change the house’s street number in an effort to distance it from Gacy’s presence. Gacy’s presence also led to a terrifying paranormal-type encounter for one of our interview guests. During the last two years of Gacy’s, our guest James spoke with Gacy one-on-one multiples times, as he gained insight into the mind of a serial killer. When the time came for Gacy to be put to death, James chose not to oblige a last request from the murderer. Two weeks after the execution, he awoke to find the ghost of Gacy in his room, staring and snarling at him. The full account of James’ ghostly encounter and the time he spent with John Wayne Gacy can be heard on Episode 116: Serial Killer John Gacy - Life After Death. 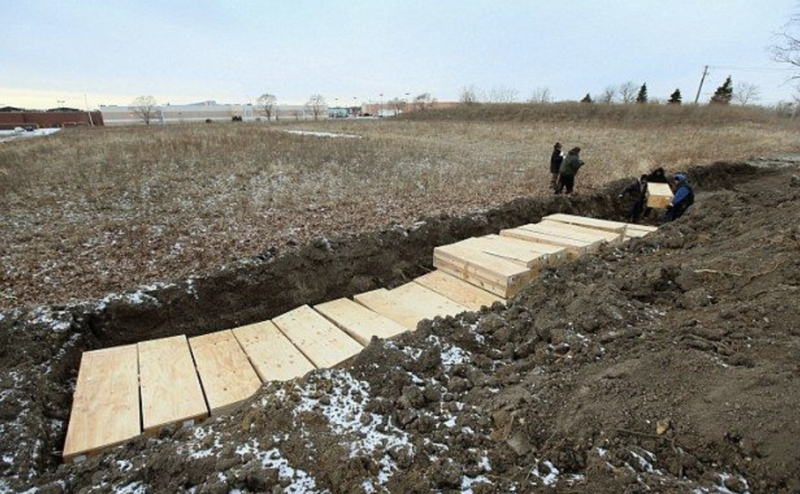 Have the evil works of these serial killers left them restless in the afterlife? Is their dark legacy so strong that they are still hunting for victims? Their own lives may over, but these serial killers are continuing to instill fear even from beyond the grave. Have you heard of any other serial killers who have manifested in ghostly form? Tell us about it in the comments! 1) In October 2018, a couple reportedly discovered the face of a demonic monk in one of their photos taken in an old slaughterhouse cellar in Nottinghamshire. The building, which is abandoned, was a stop on the Ghost Hunts UK tour in which the couple was taking part. Allegedly, seven monks were burned to death on that spot in the 1500s. 2) In August 2018, a woman exploring Tintern Abbey says she captured the ghost of a monk standing outside the abbey at night. Tintern Abbey was founded by Cistercian monks in 1131. When the Black Death swept through in the 1340s, many monks succumbed to the disease. 3) In January 2018, a father visiting Eynsford Castle in Kent claimed to have photographed the specter of a monk outside on a ruined staircase. 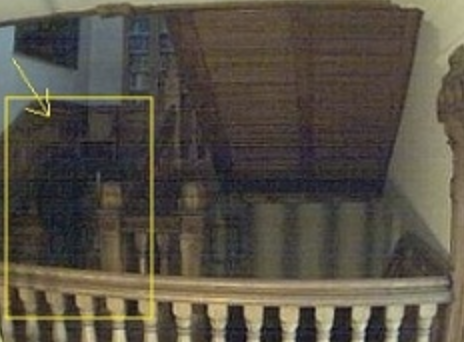 Though the figure appears to be very solid, the man says he remembers nothing standing on the stairs when he snapped the photo. Eynsford Castle dates back to medieval times, and according to local lore, one of the families who once owned the castle had a son who left them to become a monk. 4) In October 2016, a ghost hunter claimed to have caught an image of the famous Black Ghoul Monk. She believes the photo, taken at 30 East Drive in Pontefract, West Yorkshire, shows the monk’s robed arm clutching a rosary. 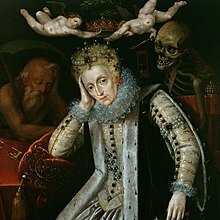 The home is the site of one of Europe's most powerful alleged hauntings which began in the 1960s, when the Pritchard family moved in and began to be tormented by the Black Monk. 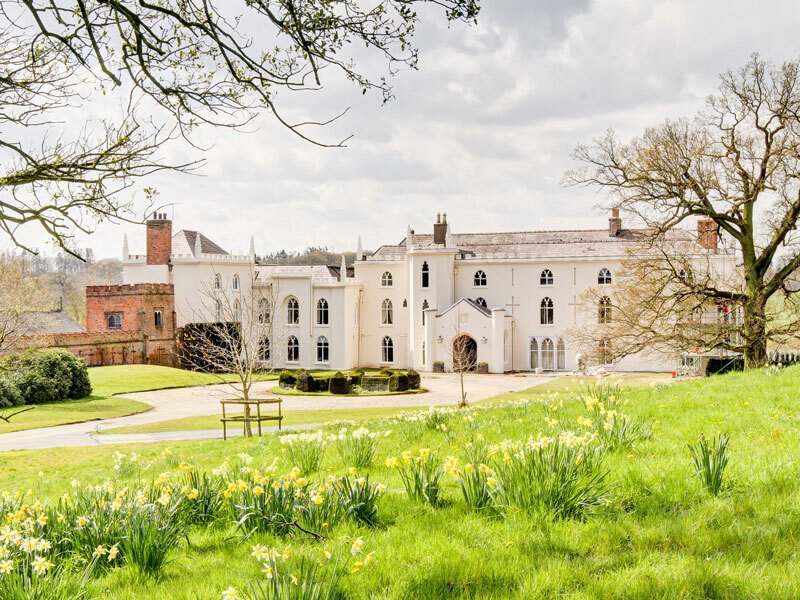 The spot where the shadowy photo was taken is purportedly where the Black Monk is often seen, and also where the Pritchards’ daughter Diana was violently dragged by an invisible hand that left fingerprints on her throat. 5) In February 2009, a woman who had visited Valle Crucis Abbey in Llangollen was looking at her photos after the trip, and was shocked to see an unknown face staring out of the ruins. The abbey was founded in 1201 by Madog ap Gruffydd Maelor, who was buried in the abbey upon his death in 1236. Shortly thereafter, the structure was badly damaged by a fire. 6) In 1963, a photograph dubbed “The Spectre of Newby Church” was taken in the Church of Christ the Consoler, on the grounds of Newby Hall in North Yorkshire. It shows a spooky image of a transparent, cloaked figure with a distorted white face standing at the church altar. Some have speculated that the photo captured the spirit of a 16th-century monk wearing a white shroud over his face, possibly masking a disfigurement or leprosy. But others contend that the photo is a hoax, either perpetrated by someone in costume or through the manipulation of superimposed photo images. The church itself does not date from the 16th century, having been built between 1871 and 1875 in memory of one Frederick Vyner, who was kidnapped and murdered in 1870. Which photo do you think is the most convincing evidence of ghost monks? TGIF, amiright? If you’re staying in and surfing through Netflix for a movie on this Friday night, you may want to skip these haunted titles. According to Slapped Ham, these 10 films are cursed movies that still haunt the cast and crew. Were they all affected by supernatural forces, or just really, really unlucky? Watch and found out, if you dare! For those who are not able to watch the video, here is the list of cursed titles for you to check out later! Were you surprised to see any of these titles on the list? Which cursed flick are you tempted to watch now? On the corner of South Washington Street and East Philadelphia Avenue in Boyertown, Pennsylvania is a red brick building. Three stories tall and largely unadorned, it doesn’t stand out from its neighbors, blending in to blocks of similarly-styled buildings without a second glance. Small shops rotate through the ground floor, while apartment dwellers come and go through its top two tiers. Except for a commemorative plaque hung on the front of the building, one would never know that on this particular site, 171 people died in a single night. The Rhoads Opera House in ruins. Although the history of deadly disasters in the United States seems to widely overlook this small-town horror, Boyertown itself has never forgotten the shocking tragedy that was the Rhoads Opera House Fire. 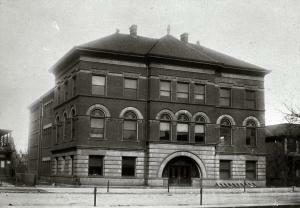 On the evening of January 13, 1908, over 300 theatergoers and 50 actors gathered at the Rhoads Opera House for the opening night of a production called “The Scottish Reformation.” The term “opera house” was a bit of a misnomer, as the theater only comprised the second floor of the commercial Rhoads building in which it was located. Though the venue was in fact small compared to its grand name, the play was eagerly attended by the hundreds, and featured the latest slide projection technology and dramatic staging effects. Through an unintended tragedy of errors, it was this new technology that served as the catalyst for the catastrophe to come. The Rhoads commercial building before the fire. While the rapt audience waited for the play’s third act to begin, an inexperienced projectionist with only two days of training mistakenly turned a wrong valve on the projector, which then hissed and startled a few theatergoers seated nearby. Hearing commotion in the audience, several actors raised the curtain to see what was the matter. When they did, they tipped over a kerosene lamp that had been set on the stage for extra lighting. The overturned lamp immediately started a small fire, but theater personnel quickly responded to tamp down the flames. With the fire nearly extinguished, some of the men in the front row decided to move another kerosene tank, kept under the stage, that fueled the theater’s footlights… as a safety precaution. The decision proved deadly when the tank’s framework broke, dumping the tank of kerosene across the stage and igniting the small fire into an inferno. In seconds, the stage became a virtual tinderbox. Its curtains burst into flames, quickly followed by the wainscoting of the 12-foot ceiling, until the entire auditorium was engulfed in “waves” of fire. Frantic audience members scrambled towards the main exit, only to find themselves trapped inside when the panicked crush of people tried pushing against doors that opened inward. Although the second floor contained two window fire escapes, they were unmarked and located three feet off the ground, nearly unidentifiable amidst the chaos. Chairs, debris, and bodies made the auditorium a maze of obstacles that blocked exits and cost precious time getting to safety. When one of the main exit doors was finally broken open, some victims were trampled to death as the crowd stampeded forward, while others fell to their deaths down the building’s staircase. Still others jumped from windows to the ground below, and not everyone survived the attempt. But most of all, trapped theatergoers burned alive. While many people did manage to escape outside, nearly 200 men, women, and children perished while the fire raged. Smoking rubble after the fire. Hours later, when the very literal smoke finally cleared, the full scale of the fiery tragedy was revealed. With a death toll of 171 people - 170 who attended the play and one firefighter - the little community of Boyertown had shockingly lost one-tenth of its population. In a few cases, entire families - husbands, wives, children - had died in the opera house blaze. Two-thirds of the dead victims were women and children, leading some to surmise that the men in attendance had abandoned them to fend for safety by themselves. When rescue workers entered the burned-out building, they discovered bodies piled six feet deep at the top of the stairway, where the surging crowd had bottlenecked and trapped themselves inside. Because of the overwhelming number of bodies, three makeshift morgues had to be set up in surrounding buildings, while the remaining town worked to identify the victims and cope with the sudden, shocking loss of life. Another angle of the fire’s aftermath. A line of residents looking for loved ones among the bodies of the fire victims. In the days that followed the disaster, 15,000 people converged on Boyertown to attend dozens upon dozens of funerals. 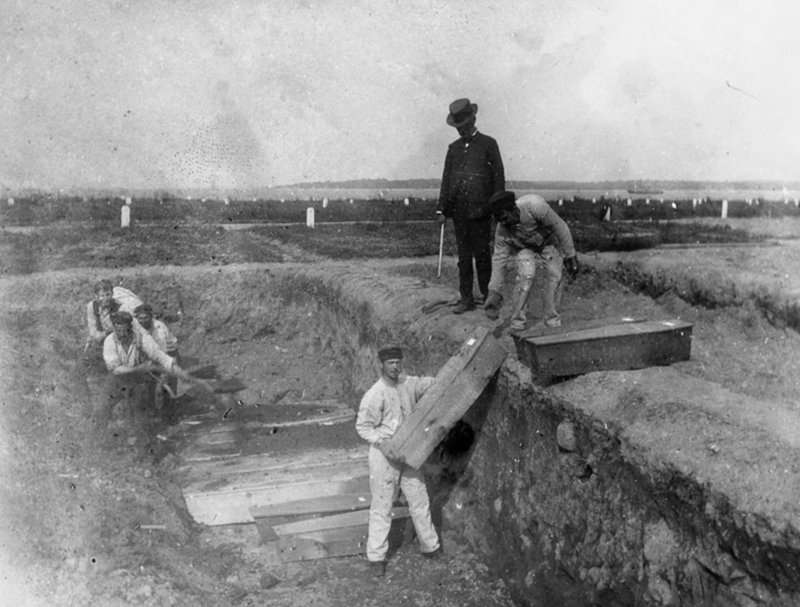 The renowned Boyertown Burial Casket Company, which was to become one of the largest casket manufacturers in the world, was hard pressed to meet the sudden demand for its products and its gravediggers, and had also lost a few of its own workers who had attended that doomed performance of “The Scottish Reformation.” In an unfunny twist of fate, those workers had unknowingly crafted the coffins they would be buried in. Over 100 new graves were dug in Boyertown’s already large Fairview Cemetery, including a common grave for 25 victims whose remains were so badly charred they could not be individually identified. While the town mourned in earnest, the theater fire made headlines across the country, and spurred new legislation for fire safety laws in Pennsylvania. There seemed to be no one in the town who had not been in some way affected by the Rhoads Opera House Fire. An enhanced version of the photo above: “Victims of Opera House fire Boyertown PA Jan, 08”. Thousands gather in Boyertown after the fire to identify loved ones and attend funerals. “Preparing for the burial Opera House fire victims Boyertown PA Jan. 13, 08.” More and more graves being added to Fairview Cemetery. Even after 111 years, traces of the tragedy have always remained. To many in the local area, Boyertown is considered one of the most haunted small towns in America. Between its historic buildings dating back to the 1700s, the looming specter of the Boyertown Burial Casket Company (which operated until 1988), and the imposing Fairview Cemetery with its approximately 7,000 graves, there is little doubt that the town is home to all kinds of paranormal activity. There is also no doubt that a significant amount of that paranormal activity has been attributed to the horrific theater tragedy that claimed so many lives. 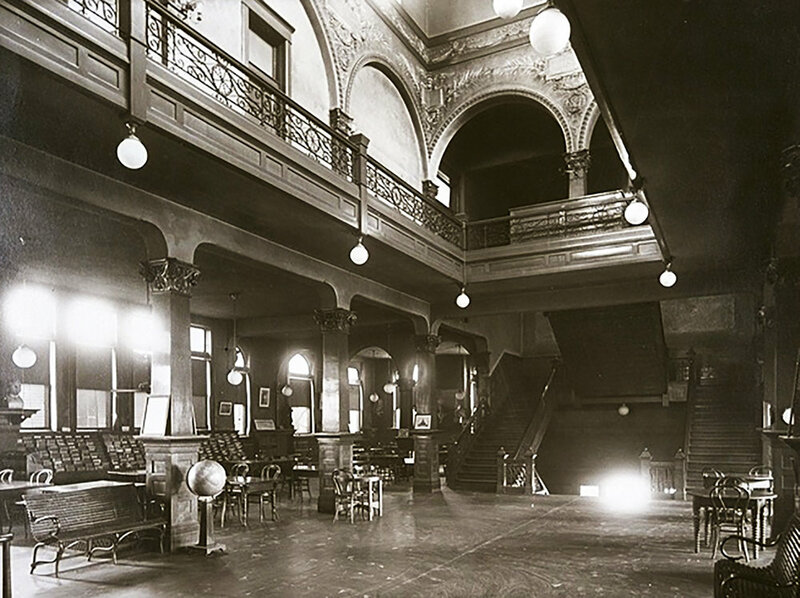 From nearly the very night of the deathly fire, the Rhoads Opera House ghost stories began. ”Ruins of the Opera House Boyertown PA Jan, 08”. 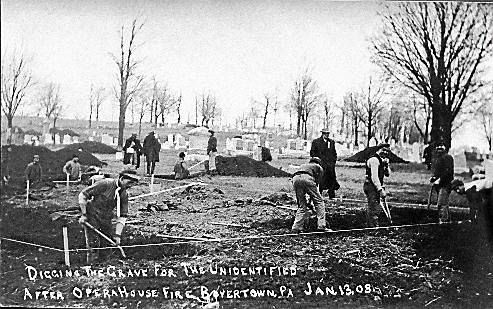 ”Digging the grave for the unidentified after Opera House Fire, Boyertown, PA Jan 13, 08”. Following the fire, while the ruins of the building still smoked, police were called to the scene to remove an elderly man from the wreckage. He told the responding officers that his dead wife’s ghost had called him to that specific spot on the site, to talk to her a final time. Workers attempt to remove and identify bodies after the Boyertown theater fire. Officers were further called out to the ruins on multiple occasions, for weeks following the event, because residents and passersby claimed they could hear screams and cries coming from inside the building’s hull. A woman who lived nearby also claimed that spirits of the dead victims had taken over her house, though details of her paranormal experiences have not emerged. The Boyertown theater fire making headlines. ”Scene at the temporary morgue after Opera House fire Boyertown PA Jan 08”. The sound of on-site screaming has continued to recur, for years, along with investigations of moaning and strange noises coming from inside Fairview Cemetery. Although the remnants of the Rhoads Opera House building were torn down and rebuilt a few years after the fire, the haunting experiences live on. A present-day resident who lived across the street from the old Opera House shared, “I’ve lived here my entire life and have heard so many ghost stories about the building. One old resident of the apartments there swore that every year around the same time a woman dressed in fine clothes would walk through the apartment, proclaiming to be late for the play.” Still another resident reported that, when the new building housed a dance studio sometime after the fire, the younger girls refused to use one of the dance rooms because it was “full of ghosts.” Even the area surrounding the fire site bears invisible traces of tragedy, with some believing that the victims who were placed in the makeshift morgues never truly left. A covered body is removed from a second story window. “After Opera House Fire Jan 13, 08. Boyertown PA” - a devastating look at the victims laid out in temporary morgues. Thousands attend funerals for the Rhoads Opera House Victims in Fairview Cemetery. An artist captures the scene as victims of the Rhoads Opera House fire are taken to Fairview Cemetery for burial. The Mansion House Hotel in the early 1900s. The most notoriously haunted of these morgues is probably Durango’s Saloon, a present-day bar located one block from the fire site, in what was formerly the Mansion House Hotel. It was in the basement of the Mansion House Hotel where rescue workers laid out corpses pulled from the Opera House rubble. Today, Durango’s Saloon still seems to be rife with paranormal activity, from shadowy figures glimpsed out the corners of eyes, to items being moved or pushed over, to strange mists appearing in photographs. The bar’s owner once even found himself locked in his walk-in freezer when its large, heavy door inexplicably slammed closed behind him. When local paranormal investigator Scott Wiley conducted his own investigation in Durango’s Saloon, he reportedly captured some compelling EVPs during his three nights in the bar. 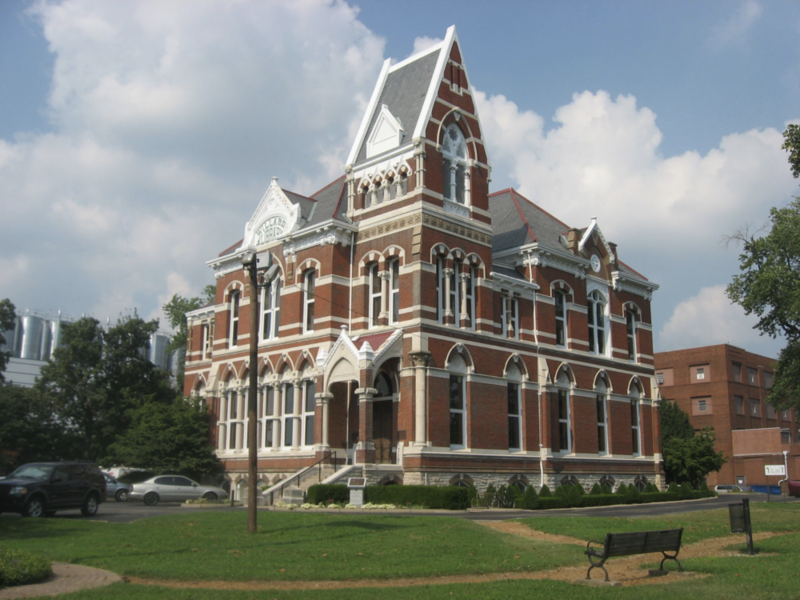 During one session Wiley asked aloud, “Who’s there?” and says he caught the whispery but distinct reply of “Binder.” Research of the area uncovered that a Henry Binder was in fact the proprietor of the old Mansion House Hotel in the early 1900s - until he was killed in the Rhoads Opera House fire. Binder’s body was buried up the street in Fairview Cemetery, but his spirit, it seems, lingered behind. With the horror of the Opera House fire impacting so many people, for so many years, there is probably no shortage of those who can share a ghostly story about the theater fire, or about haunted Boyertown itself. I have a few stories of my own. Part of Fairview Cemetery today. Listeners of The Confessionals may recall the very early Episode 3: “Hatman and Ghostly Interactions”, where I shared with Tony a number of spooky and paranormal occurrences that I experienced while living in several different homes. The home where I had the majority of my eerie experiences was an old Victorian, built in 1900, located on the same road as the Opera House fire site (0.4 miles away to be exact). In even closer proximity was the huge, somber Fairview Cemetery, barely 400 feet away and visible from the house. My elementary school bus stop was actually directly in front of the cemetery entrance... not exactly the most inviting of places to hang around when you are 5-to-10-years old! I remember walking through the cemetery on some occasions and being confounded by the sight of old, ornate gravestones marking the burial places of children who were my own age and even younger - how could they have lost their lives so early? My elementary school bus stop. Though I was too little at the time to be familiar with Boyertown’s history, the ghostly impression that Victorian house left on me has drawn me to learn more about the home, hoping to uncover a possible reason behind what, to me, was its pervading sense of spookiness, punctuated by unexplained events and fearful feelings. 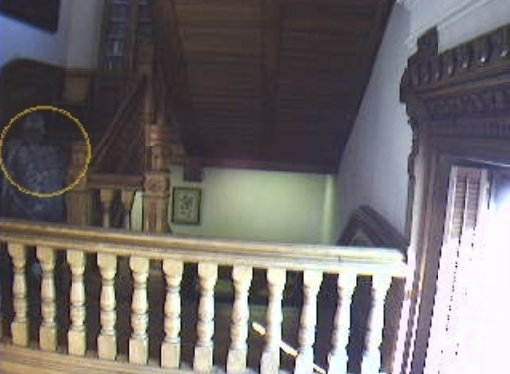 One experience in particular, which gives Episode 3 its name, was the very brief but distinct sighting of a hatted shadow figure watching me from a doorway. Though the glimpse was quick, the figure was clear: a featureless shadow man, bearing the silhouette of a tail coat, higher collar, and top hat. He never appeared again, but I have always wondered about what I saw. That wonder has led to my amateur research uncovering a tenuous but tangible connection between my old home and the Rhoads Opera House Fire. The doorway (left) in my old home where I glimpsed a shadow figure in a tail coat and top hat. At that time the doorway did not have any attached doors; these were added by a later owner. Through archived newspaper articles, I recently discovered that a man named Leon E. Mayer lived in the same house that I did, in at least the late 1930s and early 1940s. Further records revealed that at around 15 years of age, Mr. Mayer lost both his father and his sister in the 1908 disaster. 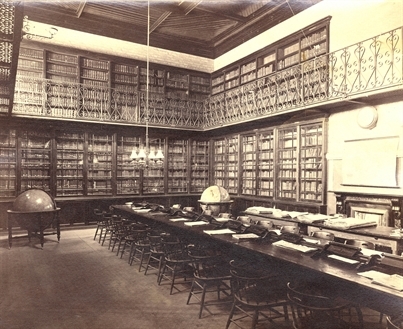 Dr. Charles Eugene Mayer and his 18-year-old daughter Gwendolyn were in attendance at “The Scottish Reformation” when the fire broke out. According to a Reading Eagle article published on the 100th anniversary of the fire, “Mayer fought off smoke and flames to reach his wife and carry her to safety outside the building. Then, he went back in to rescue his daughter. It’s not known whether Mayer found his daughter amid the smoke and flames, but neither made it out.” After their deaths, Dr. Mayer and Gwendolyn were buried in Fairview Cemetery. 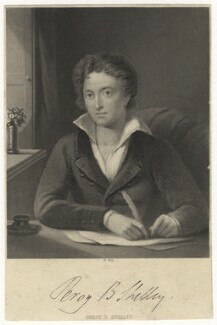 Dr. Charles Mayer. March 18, 1863 - January 13, 1908. Gwendolyn Mayer. September 30, 1889 - January 13, 1908. As of yet, I haven’t found the key detail that I’d like to know - who lived in my creepy old house at the time of fire? - but this little revelation about the Mayer family is still intriguing. Leon Mayer and his family, like so many families in Boyertown in 1908, suffered a tragic loss that would forever be attached to those left behind with their grief. Did Leon Mayer carry a piece of his grief with him while he resided in the home where I used to live? Did it manifest in the strange activity that I experienced? Was it his likeness that appeared in shadow form in my living room doorway? Or does the figure date back even further - was it is an echo of Dr. Charles Mayer, lost to the Opera House fire just down the road? I can’t say with any certainty whether Leon Mayer moved in to my former home well after the fire, or if it was his family home where he had once also lived with his father and sister; I can only speculate and theorize while I continue to dig into small-town history. But even if my paranormal experiences in the Boyertown house are not at all related to the the former Mayer family residents, there is still the fact that the town lost a tenth of its inhabitants in the Rhoads Opera House Fire, and touched nearly every family with its devastation. There is a strong possibility that whoever did live in my home in 1908 bore their own personal connection to the fire, and, perhaps, left a residual force behind them. Again - this is pure speculation based on a few thinly related facts. But one other thing that stands out to me now is the appearance of that shadow figure in the doorway. Reports from the night of January 13, 1908 recorded that Boyertown’s theatergoers were “dressed in their Sunday best.” “Sunday best,” for a man in the early 1900s, was unquestionably a tail coat, collar, and top hat… a uncanny match for the shadow man who appeared in my circa 1900 home, only blocks away from the Rhoads Opera House. While looking into my previous home’s history, I found one other story that caught my attention, not only because it further involves the Mayer family, but because it also reveals how quickly after the Boyertown fire its ghostly legacy seems to have begun. The story comes from Dr. Charles Mayer’s own grandson - not from Leon Mayer, but the child of his younger son - and was published on his blog in 2012. 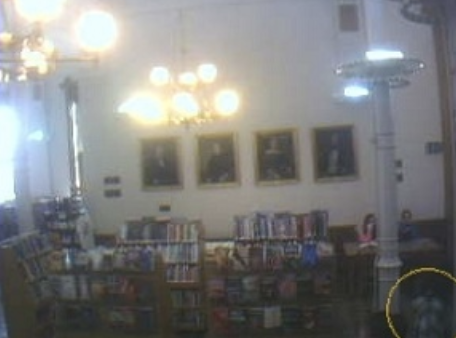 In it he recounts how his father woke on the night of the fire to the sound of the hall clock. Strangely, he says, the clock chimed not 12, but 13 times. The next morning, he was confronted with the terrible truth that his father, Dr. Mayer, and sister Gwendolyn would not be coming home again. A current view of the site of the Rhoads Opera House fire. Although details in the full story differ from other records (something to be expected as more and more years separate us from the original inciting event), it is clear that the tragedy of 1908 is still leaving its mark. Generations later, families are still affected by who was lost, and a town is forever different because of what transpired. Today the site of the Rhoads Opera House fire is occupied by offices, apartments, and a cozy secondhand bookshop. The fire and the death it brought are over one hundred years in the past. 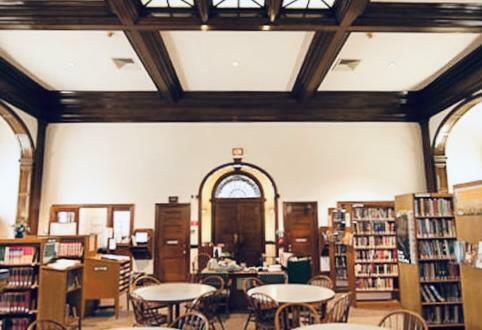 But for anyone who has heard the echoes of the screams from the Boyertown building on the corner of Philadelphia Avenue and Washington Street, the dead may not be altogether gone. The plaque on the former site of the Rhoads Opera House - “Dedicated to the 171 people who perished within these walls in the tragic fire of January 13, 1908”. For more information about Boyertown and its haunted history, contact the Boyertown Area Historical Society. To hear my own haunted experiences of Boyertown and other homes in Pennsylvania, listen to The Confessionals Podcast Episode 3: Hatman and Ghostly Interactions on your favorite podcatcher. Ugly Holiday Sweaters for a Crypto-Paranormal Christmas! That’s right - the month of December is also the perfect time to pull out your hideous knitwear and proudly parade it in public, all in the spirit of Christmas! This year, TODAY, Friday December 21, 2018, marks National Ugly Christmas Sweater Day. The only thing worse than this ugly Krampus sweater is paying $69.00 for this ugly Krampus sweater. Does it make the sweater more or less ugly if it comes in vest form? Probably both. He sees you when you’re sleeping because he’s big enough to look into your bedroom windows. A Bigfoot, a unicorn, and a jackalope walk into a sweater. This is actually pretty tame as far as ugly Christmas sweaters go, but the sweater model just looks so majestic. If you’re not sure whether your holiday yeti sweater is ugly enough, make it battery-operated and remove all doubt. Holidays are all fun and games until someone gets impaled by a unicorn. I don’t really want to have a hairy anything, thank you. Every time a bell rings, a Mothman gets its wings. Some kids want Santa to bring them a pony for Christmas. Other kids just want a legendary Scottish plesiosaur. The alien invasion comes bearing gifts. And polka dots. So many polka dots. Mix a little redrum with your eggnog for a festive holiday drink. The perfect cardigan for your office Christmas party or casual Fridays at Ghostbusters Headquarters. Better not feed this Gremlin sweater after midnight, or it’ll turn into an even uglier sweater. Nothing screams Christmas cheer like a possessed homicidal doll. Have yourself a creepy little Christmas. Zombie Santa is going to need a little more than milk and cookies when he lumbers down your chimney. I don’t know if this is paranormal or just really weird, but it is an actual nightmare before Christmas. Scary, merry Christmas, everyone! Which ugly sweater will you be wearing this year? Written Confession: Another Roof Walker Encounter? The following written confession was submitted via email following the release of Episode 95: The Roof Walker. “I was listening to episode 95 roof walker with kasey. She didn’t mention what city/town in Texas she was from. I had an situation where “something” ran across my roof. Never found out what it was but I am also from a town in Texas near the Mexican border where Santa clause wears shorts and has an accent . . .
Picture it: San Francisco, 2017. I was three months pregnant with our first child, Tony’s beard was at its zenith, and we were vacationing in Frisco for our ten year wedding anniversary! It was probably only our third vacation ever in the last decade, so every day we were checking multiple places off of our “must see” list. 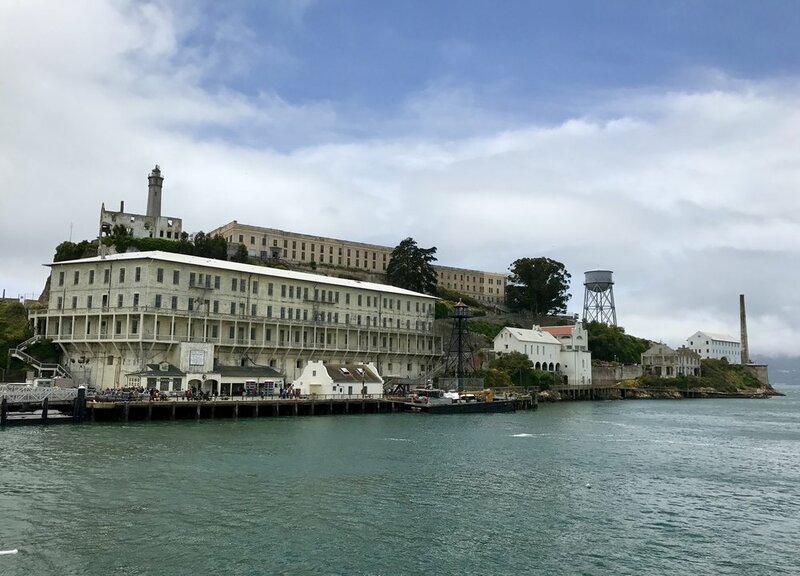 Our trip would certainly not have been complete without an excursion to a very famous and historical landmark - Alcatraz, one of America’s most haunted prisons. 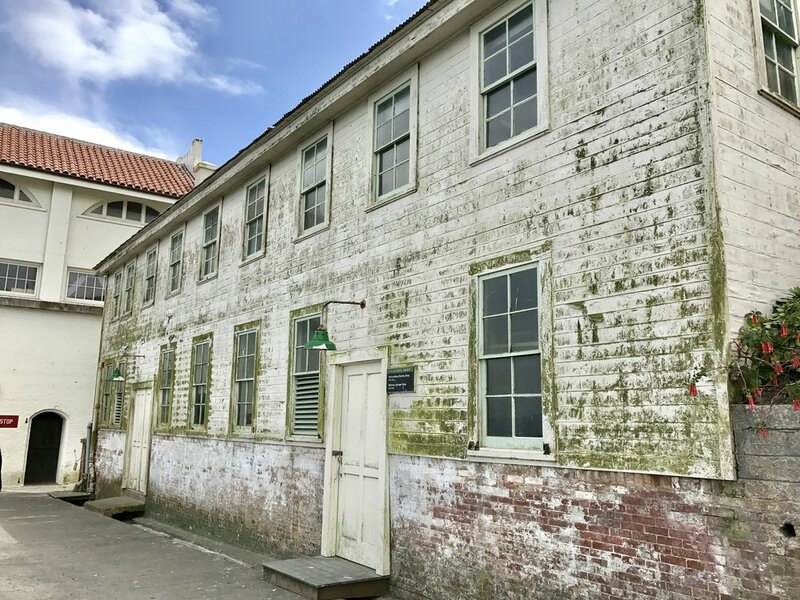 Known as “The Rock”, Alcatraz Penitentiary has a long, chilling history, which seems to echo through its dilapidated buildings as tales of Alcatraz’s hauntings continue to this day. Originally built as a military fortress in the 1850s, Alcatraz was converted into a military prison in 1868. 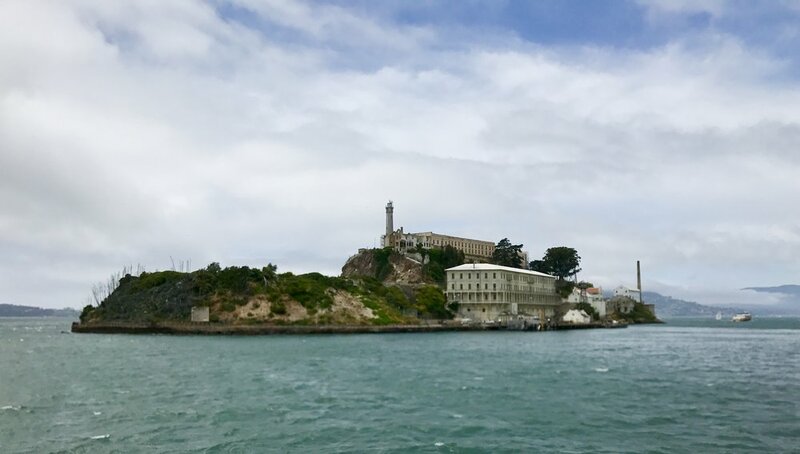 Situated one-and-a-quarter miles offshore in the San Francisco Bay, the island’s steep, rocky topography and location in shark-infested waters made it an ideal place to confine violent criminals. The first fortress-prison was demolished in 1909, and a new prison was rebuilt in its place by the prison’s own inmates. After the prison fell into disrepair in the 1920s, it was again closed, restructured, and reopened in 1933, this time as a federal prison claiming to be “escape-proof.” Alcatraz continued to function as a prison for dangerous federal criminals until it was closed by Robert F. Kennedy in 1963, due to the huge financial cost it required to keep it in operation. 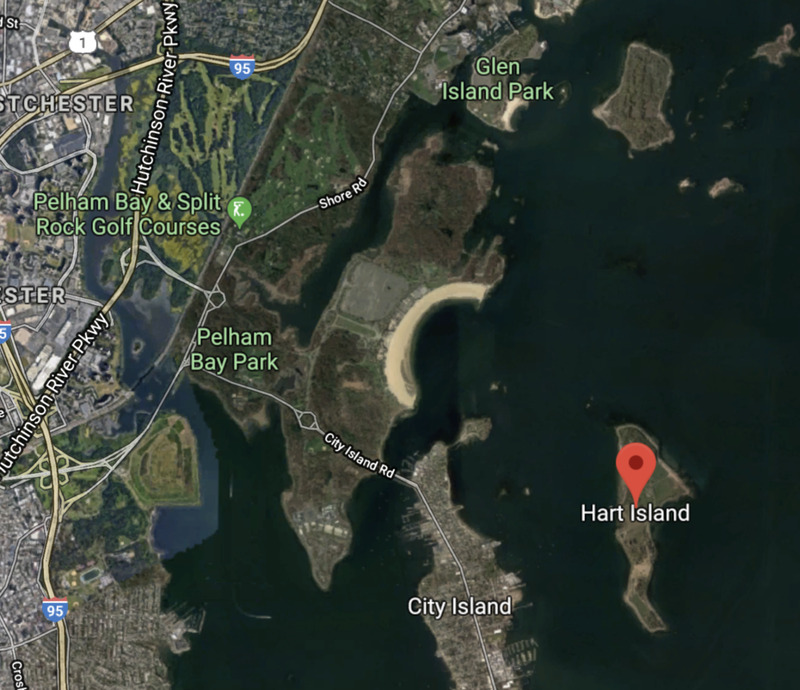 A few years later, in 1969, a group of Native Americans claimed the island, and held it in occupation for two years, before being forced out by federal marshals in 1971. Finally, in 1972, the island prison was added to the new Golden Gate Recreation Area, and officially opened for tourists and the public. - The Spanish Dungeon: Located underneath Cellblock A are cells is known as “the Spanish Dungeon.” Reportedly used during Alcatraz’s military prison era, the dungeon cells were used for the more “unmanageable inmates,” who would be taken below and chained to the bars of the dungeon, allegedly without clothes and food on some occasions. - The single Strip Cell: Feared by inmates, the Strip Cell was a steel-encased cell with no sink or toilet where unruly prisoners would be locked, without clothes, in total darkness. Offenders were usually placed in the freezing cell for 1 to 2 days at a time. - The Hole Cells: The Hole cells were similar types of cells, where prisoners were isolated from others and provided with only the bare minimum to survive- bread, water, a low wattage light bulb- for sometimes up to 19 days. Cell 14D: Cell Block D is the most famously haunted cell block. In 14D, one of “the Hole” cells, a prisoner in the 1940s once spent the night screaming that a creature with red glowing eyes was killing him. In the morning, the inmate was found dead by strangulation, and no person was ever discovered to be responsible for his death. 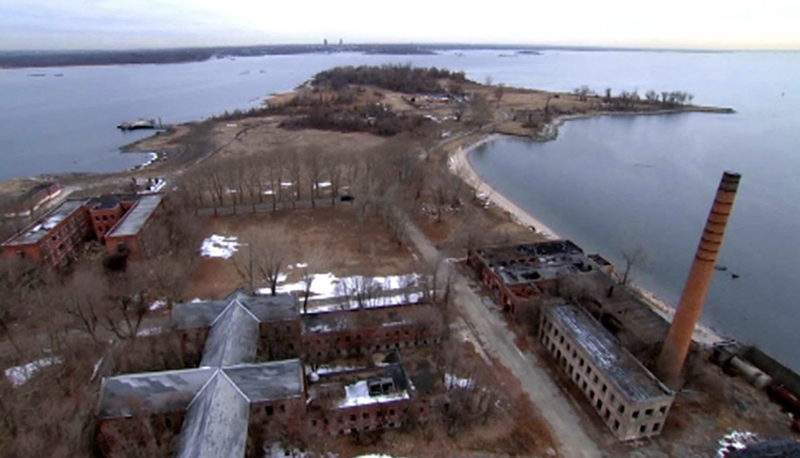 "Not too far away, just off Cell Block C, is the Utility Corridor where three prisoners who attempted to escape (Coy, Cretzer, and Hubbard) were ultimately captured and grenaded to their deaths. In this same corridor, a welded shut door muffles the eerie sounds of the spirits on this cellblock . 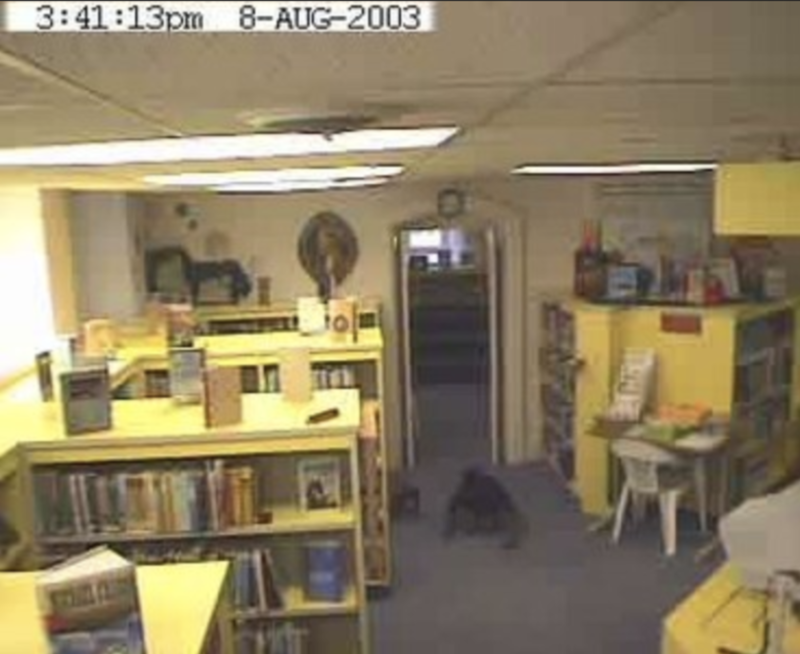 . . A guard who was watching the area at night heard odd noises coming from behind the door. It sounded as though something was knocking around in the corridor down there, but when the guard opened the door, he saw nothing that could possibly be making the sounds. He closed the door and was going to continue on his security rounds, but as soon as the door shut behind him, the noises started up again. Thinking that someone must be in there playing some sort of joke on him, the guard opened the door again and looked around the area extensively. He never found the source of the noise. When he closed the door again, the noises again resumed . . . Since that time, this area has been blocked off and that particular door has been welded shut." In the many decades that have passed since the 1850s, strange events and encounters on the island have never ceased to be reported. 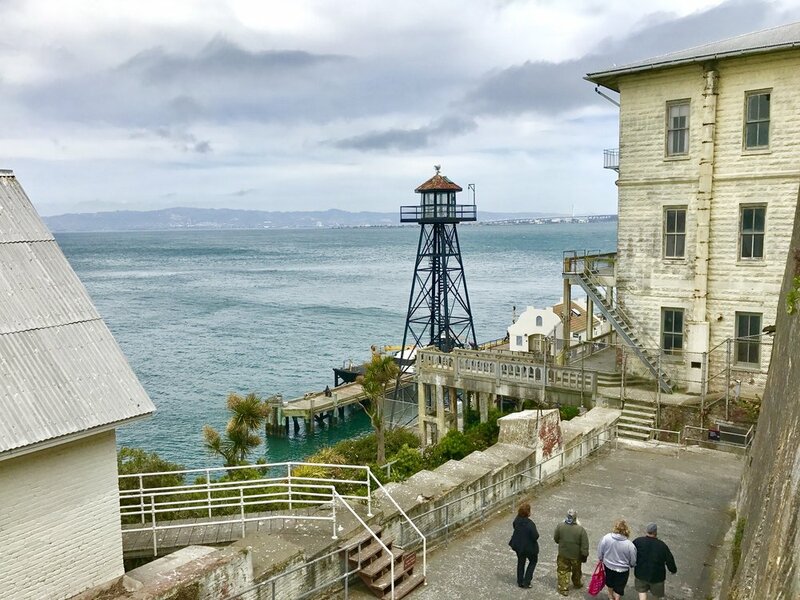 From whispering in the cells, to ghostly figures, to sounds of clanging bars and doors shutting, to disappearing smoke, to cold spots and areas where visitors are suddenly overcome with emotion, there are no shortage of ghosts lingering in Alcatraz. I'll answer the big question first - no, we didn't encounter any otherworldly activity on Alcatraz! However, our trip to Alcatraz Island was an experience not to be missed (although we almost did miss it!) 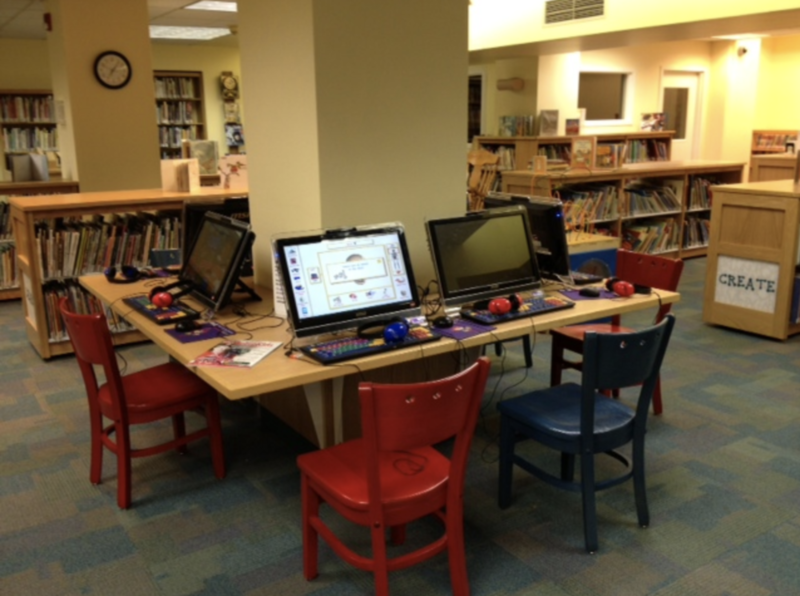 - and we're glad we had the opportunity to go! 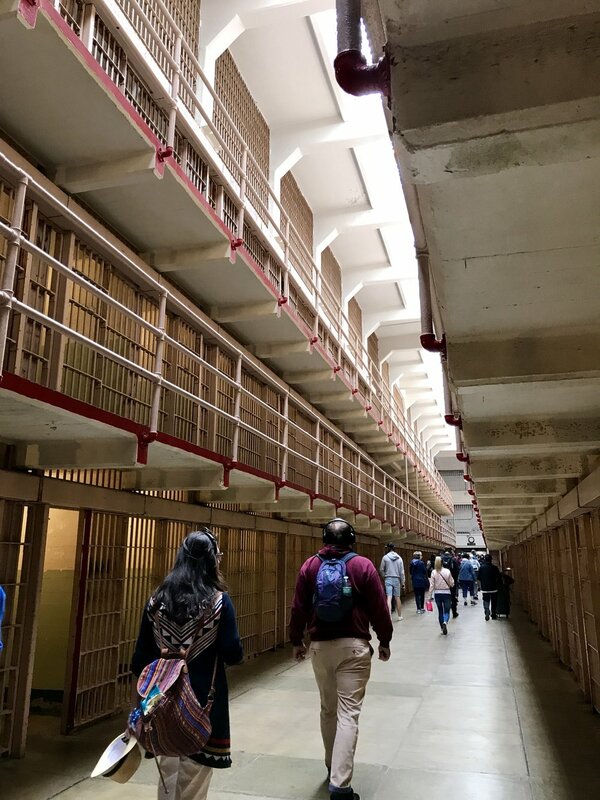 Alcatraz, as one of the most important "must see" items on our trip agenda, was the first big attraction we intended to visit while in San Francisco. 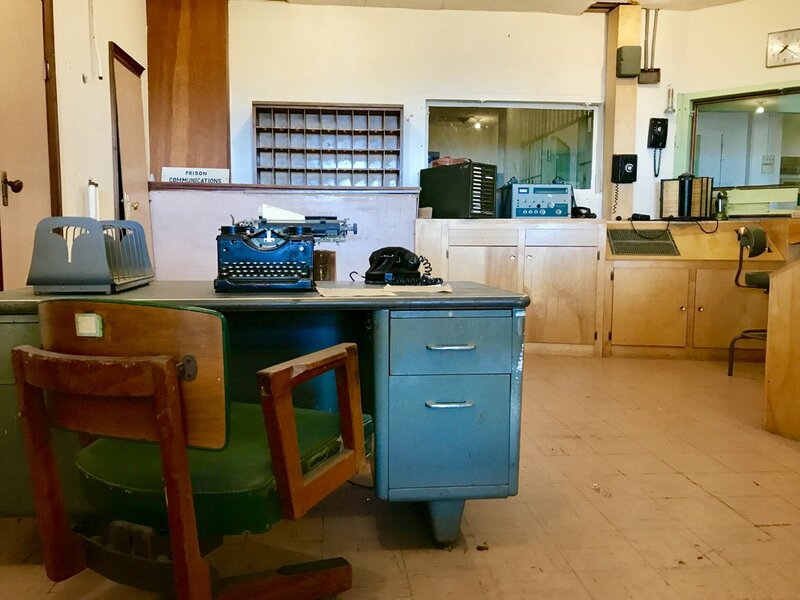 But, when we showed up at the ticket office bright and early on the first morning of vacation, those plans hit a bit of a snag: tickets to Alcatraz were already sold out, for the entire summer. With daily tours leaving every 30 minutes, every day, we were dumbfounded that there was nothing available - even considering the landmark's popularity - for the next two months! 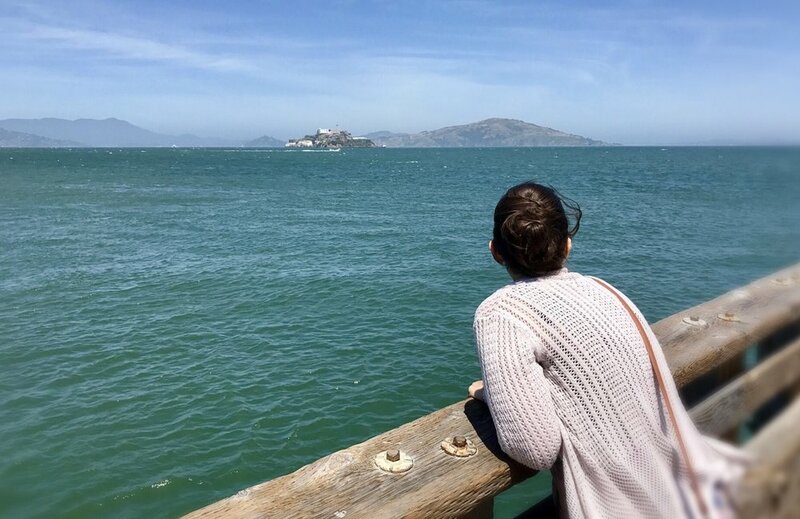 Trying not to cry at this disappointing news (which is the natural reaction to any kind of news when you're pregnant) I jumped on my Smartphone and started searching the Alcatraz Cruise website. We couldn't come all the way to San Francisco and not make it to the "main event" of the trip, right?! Lo and behold, the site came through for us: there were two tour tickets available online, for two days later - the only openings for the entire week! The tickets were promptly loaded into the virtual cart (thank you, pervasive consumer-based technology), and we returned to the pier later that week for our boat ride to Alcatraz. And, lesson learned: always pre-order tickets for popular national attractions before flying across the country to visit them. If you're looking for a creepy island where you can enjoy ghostly horrors of the past — and who doesn't look for that in a vacation? - Alcatraz is the place to visit! It’s remote, eerie, and desolate, even with hoards of tourists stomping around. 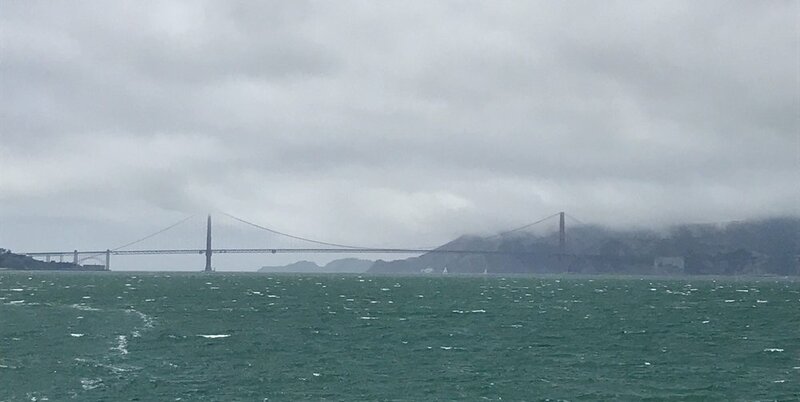 There is a quote, often attributed to Mark Twain, that says, "The coldest winter I ever saw was the summer I spent in San Francisco." 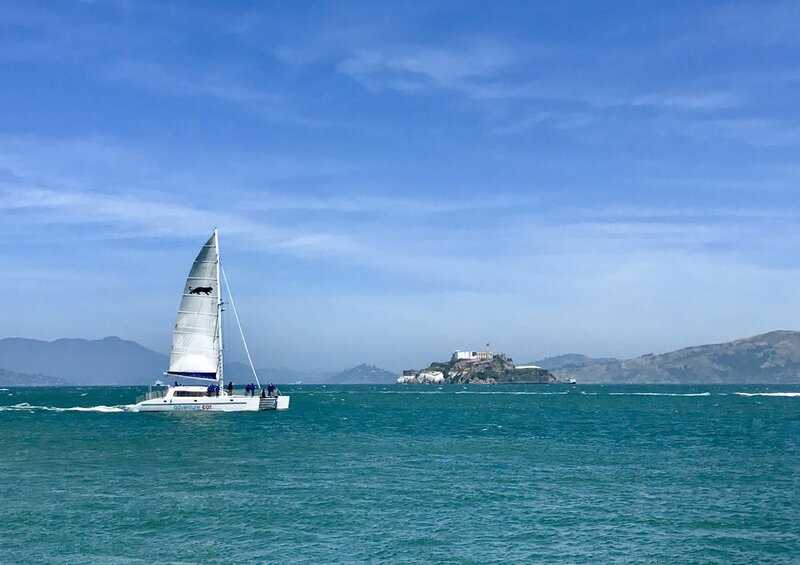 After visiting San Fran in the summer, we can both can attest to the truth of this statement; temperatures that week didn’t rise about the low 60s, and it was colder still on Alcatraz, surrounded by water and wind. The chill was everywhere, and the surrounding bay and sky alternated between blue and slate gray throughout the afternoon. Alcatraz is not a cheery place, to say the least. The ruined buildings: Many of the island’s residence buildings are in ruins, some having been demolished and some destroyed by fires in 1970. 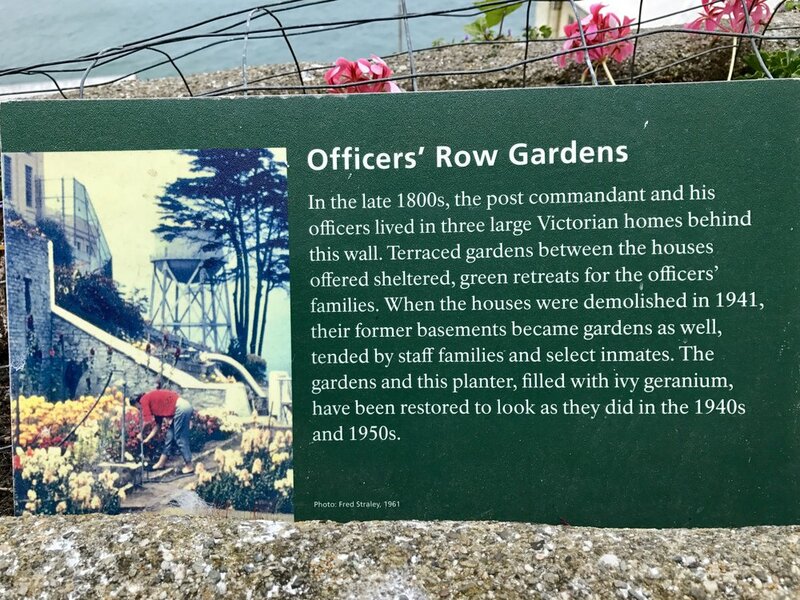 It was interesting to note, though, (in a "Yikes, I hoped they always locked the doors" kind of way) how women and children - the families of Alcatraz’s guards - had lived only steps away from some of the country’s most dangerous criminals. The morgue: This wasn’t the large, laboratory-style morgue fabricated in Michael Bay’s movie, “The Rock.” (Although I won’t lie, that would have been cool too.) 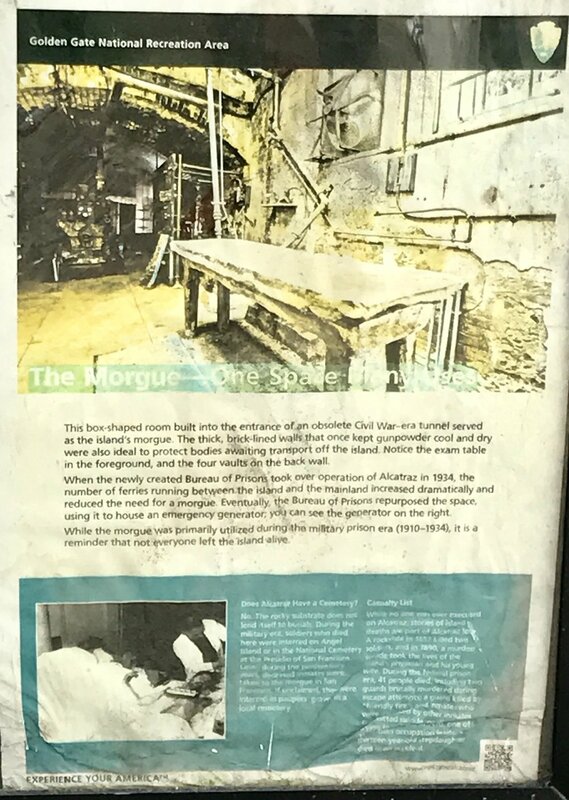 Alcatraz’s actual morgue is tucked away on the far end of the complex, housed in the entrance of an old Civil War tunnel. Despite its small size and the crowds around it, it was still a creepy place, with the mortuary slab still in place and the vaults shrouded in the darkness at the back of the room. Not a place you’d want to hang out in after dark. Or in broad daylight. Or at any time at all, really. The cellhouses: Speaking of places you wouldn’t want to hang out in after dark... The cellhouses, the centers for the main horrors and hauntings comprising Alcatraz’s history and lore, were disturbing. Granted, decay and disuse have done them no favors, but they are still scary places. Cramped, stark, and with no exposure to direct sunlight, the cells were bleak sad cubicles. The buildings were also long and shadowy, ideal places for things that like to come out in the dark - and I don’t mean the Tooth Fairy (cue eerie musical riff). If not for the presence of so many people milling about, I think the overall atmosphere of the place would have felt much more ominous and agitated. My heart goes out to any lonely guard assigned to patrol Alcatraz at night; may he have nerves of steel and carry a big stick. And now I'm going to watch "The Rock." 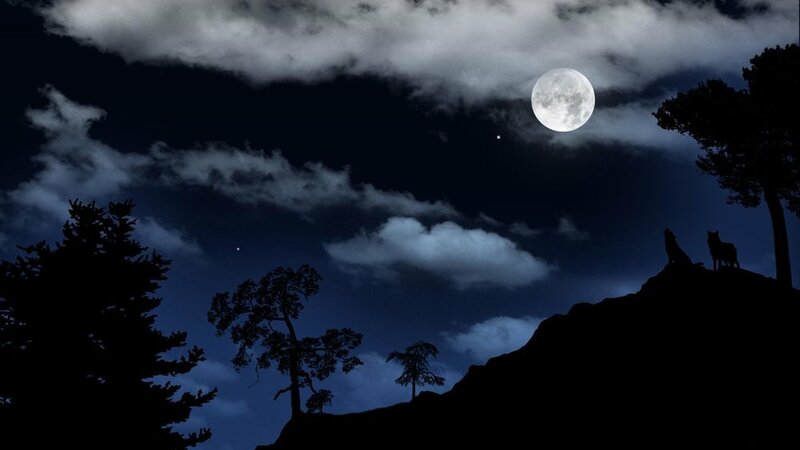 Have you visited any famous haunted locations? Share with us in the comments! Thought I'd let you know that I have had many "paranormal" things happen through out my life. It is a family trait and to me it is just normal life. Something needs to be truly remarkable to make it memorable. My mother has had many psychic incidences during her life. One just happened to save my life when I was a toddler. We lived on an isolated farm that belonged to my father's parents, who also lived there but in another house. My father worked away. One day I began to choke. My mother couldn't fix it and didn't know what to do. It must of been quite bad because she grabbed me and rushed out to find my grandmother. When she was outside the garden gate she heard a voice in her head say words to the effect of "turn the child upside down". Which she did and whatever was stuck in my throat dislodged and I recovered. One time my when my eldest daughter was about 11 she woke up with a slight fever and felt unwell so I kept her home from school. An hour or so later I get a phone call from the school. They were concerned for my child, wanting to know if I'd taken her home. She had been seen at school that morning but vanished and they were very concerned. I told them she had not been to school and was home sick but they insisted she had been there. That evening there was an event on at the school that my daughter's class was involved in and because she had recovered we went to it. As we arrived one of her friends rushed up to her asking why she had vanished from school that morning. This other kid was adamant that my daughter had been there. This confirmed it to me that the school phone call had been valid. I know of a phenomenon called "bi-location" and put the incident down to a case of this. I told my daughter that's what it was, no big deal. I have many stories, many more are forgotten. I've seen odd lights in the sky, had many out of body / astral events and encounters. Had a dark entity come into a house I was living in. (I'd never believed in them before or been scared like that). I've had so many dreams that later came true. When I was young I was able to see what people where thinking, I could see thoughts forming. One very famous person - example happened when I was 15 and it bothered me so much it put me off ever wanting that to happen again. It was a member of the British royal family who'd just had a baby.